It can be overwhelming to know what choice to make! One colour choice can make or break a design. Let Stages of Life Design take the guesswork out. Our Colour Consultation will tailor a look that suits your personal style but also, just as importantly, considering what looks best for your home. There are many studies that support the significant influence that colour has on the emotions but there are other considerations as well. The amount and type of light available to a room, architectural style, the age of the home, furnishings, and of course personal preferences are all contributing factors. 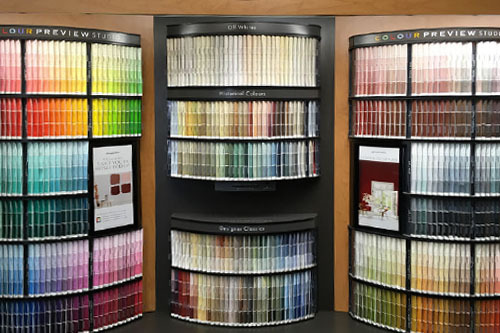 Typically the process begins with a walk through of your home, with a wide variety of colour swatches to choose from. Knowing which colours don’t appeal to you is as important to the process as knowing what colours you do prefer. Our experience allows us to use your feedback to identify options, and offer creative ways to implement them. We’ve worked with many clients to express a wide variety of tastes. We can help you find the colour palette that reflects your style and complements your home. All Colour Consultations are $100.00 an hour plus GST.